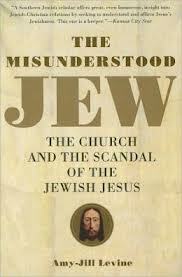 Here I continue a serialized review of Amy-Jill Levine’s The Misunderstood Jew: The Church and the Scandal of the Jewish Jesus. Dr. Levine is an Orthodox Jew who teaches New Testament Theology at the Vanderbilt University Divinity School. What follows are some key ideas from her first chapter, and my reflections. Judaism and Christianity both see themselves as complete already. They have different histories, different Scriptures, different ways of reading Scripture, different assumptions, and also both tend to validate their traditions through something very personal: faith. So where is the common ground to be found? Amy-Jill Levine says that where we can agree is on Jesus’ connection to Judaism. Beginning from there, and examining Yeshua against the background of truths as old as the New Testament, and as the past 75 years or so, she helps us see how old assumptions about Jesus, Judaism and Christianity have fallen into disrepute, and how new perspectives have emerged viewing him to have been firmly rooted in his Jewish context. That Jesus can become, and should be, and indeed is, a meeting place between Jews and Christians is also a firm conviction here at Interfaithfuness. It is something we teach about in depth and is a core conviction. We draw some conclusions about the Jewish Jesus that go beyond what Dr. Levine is saying. For example, we believe him to be the Messiah, and the Son of David through whom and in whom all of God’s promises to the Jewish people continue to move forward toward their fulfillment. Dr. Levine is less eschatological on this issue: she wants Jews and Christians to meet together and agree together on the basis of who Jesus was historically, Jesus, the misunderstood Jew. And she does a good job of it. She also underscores that here is no mention of Jesus’ Jewishness or his Judaism in the creeds of the church. I have noted this as well in my writings, and when one stops to think of it, this is astounding. The historic church makes sure to state its conviction that God became a man, but no historic church creed bothers to note that he became a Jewish man, However, there is no such thing as a generic man. In personal conversation, Dr. Colin Brown, who has been senior professor of theology at Fuller Seminary for 43 years and counting, told me that the church has not simply forgotten the Jewishness of Jesus: they have suppressed it. Dr. Brown is a polymath, a world class genius in theology with consummate knowledge of theology and the history of western civilization. He is great enough to be an iconoclast who says what people are not used to hearing. And this is one of his positions. Dr. Levine would appreciate his candor, a quality she shares. Repeatedly, she highlights how the Christian world has sought to magnify its credibility by using Judaism and the Jewish people as a foil. In order to successfully do that, the church needed to de-Judaize Jesus. And this is precisely what happened, as Colin Brown confirms. But if church and synagogue are to have a better relationship with each other and with the truth, each will have to restore the Christ of faith to his historical context, in the line of the prophets, and as Jewish not just genetically but in who he was, in what he saw his life to be about, and in how he taught and acted. For example, people need to deeply “get” the significance of Jesus telling the Samaritan woman, “You worship what you do not know; we worship what we know, for salvation is from the Jews.” For Jesus, the Jewish people are “we.” Does anyone get that anymore? Not as deeply as they should. I explore this in depth in an upcoming book, but Dr. Levine sounds the alarm. And she deserves to be heard. She speaks of a Jesus whose “connections to the basic Jewish teachings were right on target.” Is that what you have learned in synagogue, church, or the common culture? Probably not. She writes of a Jesus whose “connections to Judaism can be seen not only in his general comments about Torah but also in his practice of its commandments,” who keeps kosher, and whose principle disciple, Peter, states long after the crucifixion that he had never eaten non-kosher food. She sketches for us an apostolic culture where the Torah is for Jews, even Yeshua-believing Jews, although not for Gentiles. Does this sound like the Judaism-rejectionist Jesus/apostolic faith often assumed in our culture? Hardly! David Klinghoffer finds it unsurprising that some Jews of the time “might have chosen to confront and debate with” Jesus, since he “knowingly rejects the oral tradition, not from ignorance but from willfulness.” The problem with this view is that the oral Law itself is variable; not all rabbis agreed with one another either. . . . Even if one were to accept the highly disputed claim that the oral Law, eventually written down in the Mishnah close to two centuries after Jesus’s death, was fully in place of the time of Jesus, that still does not mean that Jesus was out of step with his fellow Jews, including those with whom the rabbinic tradition would agree, on most practices. In fact, there is no indication that Jesus had a systematic interpretation of the Torah.. . . Rather, the gospels suggest that he responded to questions as they were posting you by circumstances . . . or by those seeking is it to learn from him or test him. . . . Jesus is thus neither part of the rabbinic tradition nor antithetical to it. In some cases he would have agreed with the majority views; in other cases he’d have sided with the minority; and in a few cases, such as his for bidding of divorce, he would have been well outside of it (here on the conservative, not the liberal, wing). Jesus would have expected to be challenged, and would have issued his own challenges. But that he was willing to engage in discussion of how to follow the commandments shows that he cared about them, deeply. In his teaching, he shows an enormous respect for the mitzvot, the commandments, so much so that he debates how they are best to be understood and enacted. She goes on to speak deeply of the practice of Yeshua and his disciples, which she shows to have been well within Jewish parameters. She speaks as well of his parables, and of how these are routinely misunderstood due to how exegetes, theologians, pastors and rabbis, and lay people both Jewish and Gentile fail to discern and to preserve the first century Jewish cultural context which both informs and interprets Yeshua’s meaning and message. This failure to detect and preserve the original culture and context is largely responsible for the almost universal negative perception of the Pharisees and of Judaism. This universal misperception distorts Jesus meeting, and while failing to discern how his listeners would have understood him, imposes upon his speech and parables interpretations foreign and hostile to what he meant and what his listeners understood him to say. Take for example the parable of the tax collector and the Pharisee, who both go up to the temple to pray. The tax collector does not even have the courage to lift up his eyes toward heaven, while the Pharisee enumerates to God the ways in which he has been faithful in comparison to the low-life tax collector. What gave the parable it’s punch in the days of Jesus, is that his entire audience would have looked at the tax collector as a bum, a social reject, a lapdog of the hated Roman occupiers. It is the Pharisee who is a cultural hero, a man of spotless religious integrity. The surprise in the parable is that it is the traitorous thieving tax collector that goes home justified. Jesus is audience was shortly astonished: that we are not astonished is a measure of how far are assumptions differ from theirs. Jesus of Nazareth dressed like a Jew, prayed like a Jew (and most likely in Aramaic), instructed other Jews on how best to live according to the commandments given by God to Moses, talked like a Jew, argued like a Jew with other Jews, and died like thousands of other Jews a Roman cross. To see him in a first-century Jewish context and to listen to his words with first-century ears do not in any way undermine Christian theological claims. Jesus does not have to be fully unique in order to say something or do something meaningful.